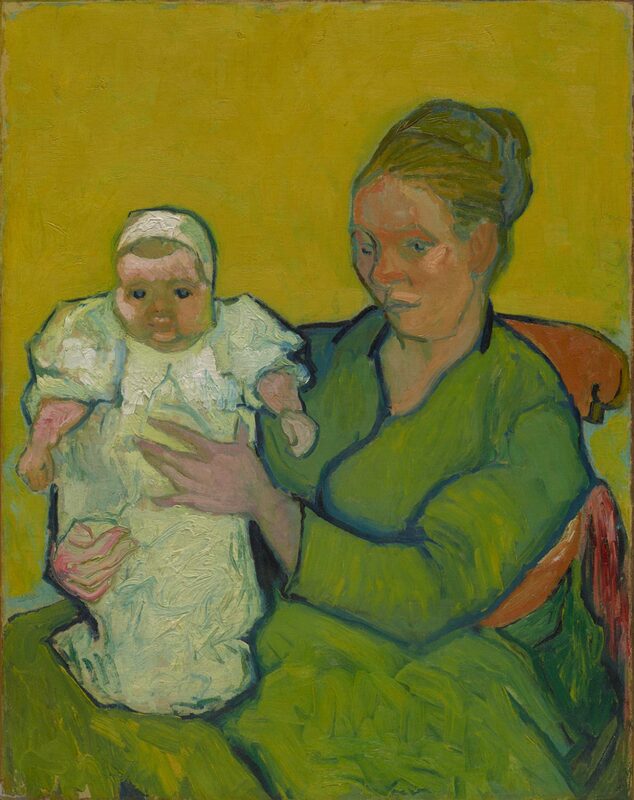 While living in Arles, France, Vincent van Gogh created portraits of the family of his friend Joseph Roulin, a local postmaster, including this painting of Roulin’s wife and infant daughter. A portrait of the family’s son, Camille, is also owned by the Museum. In early December 1888, Vincent van Gogh wrote to his brother Theo from Arles where he was staying: "I have made portraits of a whole family, that of the postman whose head I had done previously, the man, his wife, the baby, the little boy, and the son of sixteen, all characters and very French. "1 Not content with his initial portraits of the family, van Gogh continued to paint them, producing several pictures of Madame Roulin, the postman's wife. In two of them, including this one, she holds the couple's daughter, Marcelle, born in July 1888. With a relaxed pose and her face in shadow, Madame Roulin is a passive figure, while the baby, whose chubby face looks outward to engage us directly, is the more active and central subject. Van Gogh's work with color is one of the most dramatic aspects of the series; each family member is distinguished by bold primary colors in their clothing and contrasting backgrounds that correspond to different points on a color wheel. Here, the figures are painted in shades of green and white with blue outlines and a yellow ground. The use of these three colors, adjacent on the color wheel, underlines the closeness of mother and child. Jennifer A. Thompson, from Masterpieces from the Philadelphia Museum of Art: Impressionism and Modern Art (2007), p. 90. 1) Quoted in Van Gogh Face to Face: The Portraits (Detroit, Mich.: The Detroit Institute of Arts, 2000), pp. 164 and 165-41. Émile Bernard (1868-1941), Paris; with Ambroise Vollard, Paris; Amédeé Schuffenecker (1854–1936), Clamart, 1908; Fritz Meyer-Fierz, Zürich, by 1924; sale, Meyer-Fierz, Frederich Muller and Company, Amsterdam, July 13, 1926, no. 10. With Galerien Thannhauser, Munich and Lucerne (later Berlin and Paris), by 1927 to c. 1937 . Knoedler & Co., New York, joint ownership (half share) with Mme Paul Guillaume (Domenica Guillaume), June 21, 1937 to 1946 ; sold to William M. Elkins (1882-1947), Philadelphia, May 1946 ; his wife Elizabeth "Lisa" C. Norris Elkins (1898-1950), Philadelphia; bequest to PMA, 1950. 1. Exhibited at Thannhauser Galleries, Berlin, "Erste Sonderausstellung in Berlin," January 9-February 1927. Published in de la Faille, 1928 (no. 490) as Thannhauser Gallery, Munich. The Thannhausers closed their original Munich gallery in 1928; they closed the Berlin branch in 1937 and moved to Paris. 2. Getty Research Institute, Knoedler Book 8, stock no. A1882, p. 173. De la Faille, Vincent van Gogh, 1939, no. 520, lists the current owner as Reid & Lefevre Gallery, London on p. 369, although the painting is still listed under Thannhauser Gallery, Paris, in the "Index of Collections" (p. 559). According to Lefevre Fine Art (letter dated 26 February 2004, in curatorial file), the painting was owned jointly with Knoedler and sold by Knoedler; however, Reid & Lefevre are not noted as joint owners in the Knoedler stockbooks, which list only the half ownership with Mme Guillaume. Knoedler lent the painting to exhibitions in the US and Canada in 1940, 1941, 1943, 1944, and 1946. 3. Getty Research Institute, Knoedler Book 9, stock no. A1882, p. 24.